Just few days before Christmas, I was invited by the friendly people at Chicago Rib House to do a food review. 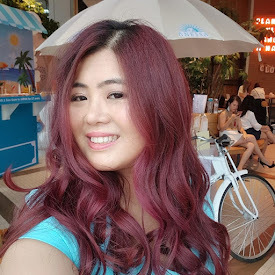 And after I check out the website link in the invitation email sent to me, I can't wait to try this because it is all about porkyyyy = my favourite food in the whole wide world!! To be honest, I did not know the existence of Chicago Rib House until I went there for the review because they just opened their 2nd branch here in 1 Utama late November (shows how long I havent been to 1 Utama) . 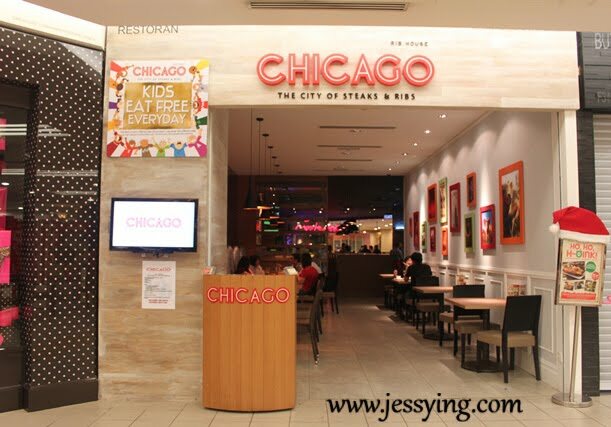 I was told the first branch is at Penang. 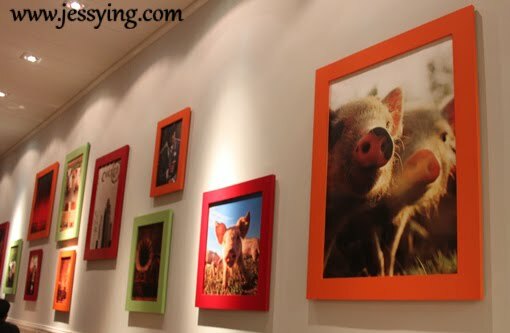 As I walked in the restaurant, I can see a lot of cute piggy pics on the walls! Confirm lah... a lot of porky will be served tonight! It's a cosy yet spacious seating at this restaurant. I like the wording at the wall - Grilld to PORK-fection! There is a Mojito Bar at the corner of the restaurant. 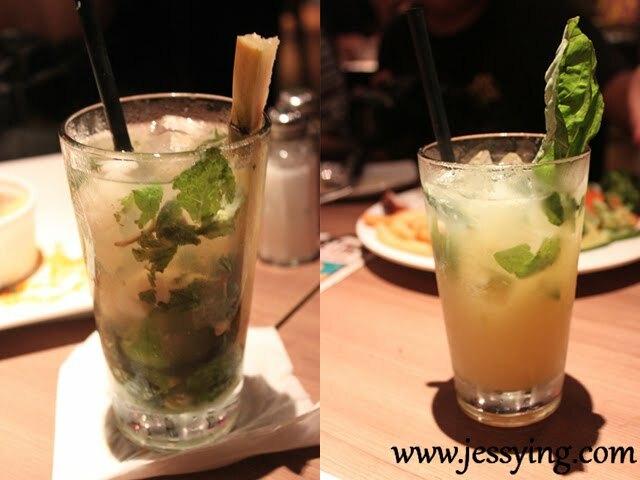 Here is some drinks we ordered - fresh from the Mojito Bars! One of it is Lychee Mojito and another one I could not remembered what is it now. 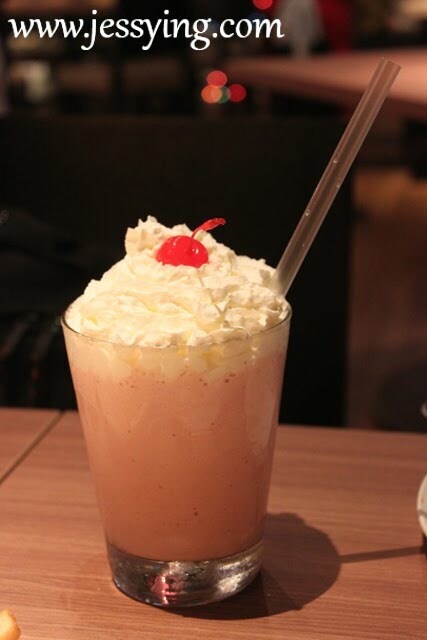 I am a milkshake person and I think I'm the only person who thinks Strawberry Milkshake is better than Mojito :P The milkshake here was not too sweet so I really like it and finish this sinful drink that night! I like this napkins because I could now rib of the pork like nobody business ! 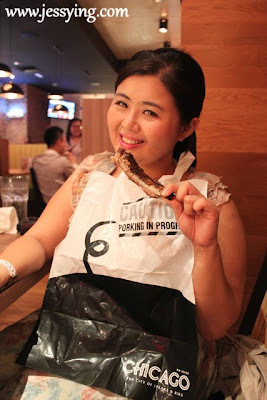 As far I remembered, no restaurant in Msia I been to so far gave napkins like this & the first time I had plastic napkins like this when I was in Korea having bbq dinner. 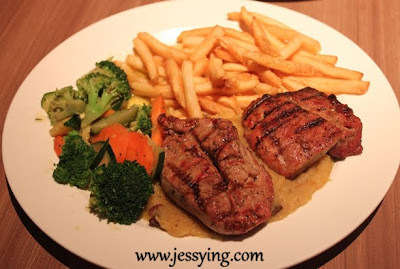 As starter, Trio Sampler (RM32.90) was served. 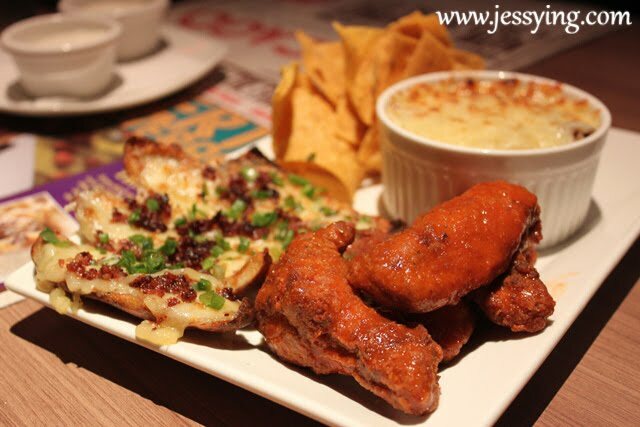 Three's a company when you've got Hot Buffalo Wings, Potato Skins and Pork Chili Con Carne. 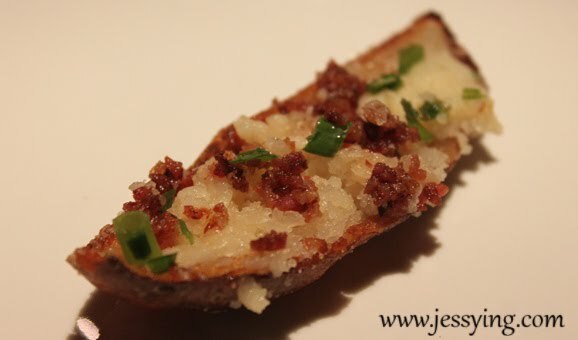 It's matched with homemade Salsa dressing to really get you started. The chicken wings is a bit salty to my liking but the spicyness makes it appetizing! 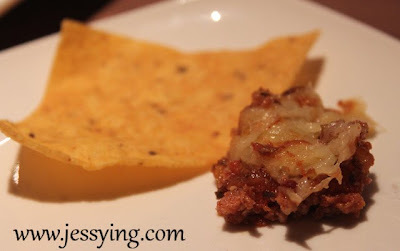 Corn chips & Pork Chili Con Carne . Onion, pepper & cheese and corn chips are the perfect match! 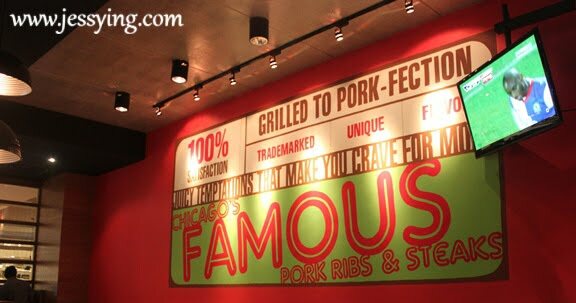 Description: Chicago's Pork Ribs are slow roasted in hickory wood to give it that tender and unique flavor that has made us world famous. 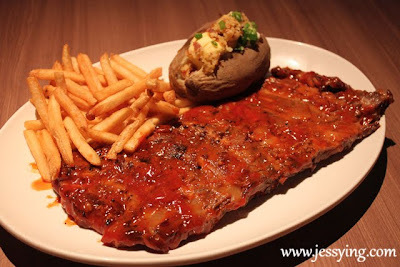 Our succelent and meaty pork ribs are served with your choice of two sides of your choice. 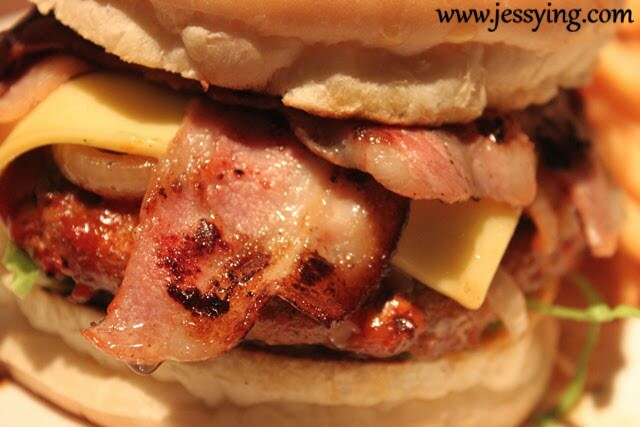 If you like BBQ sauce then I think you will like this. But for me it is a bit sweet for my liking. 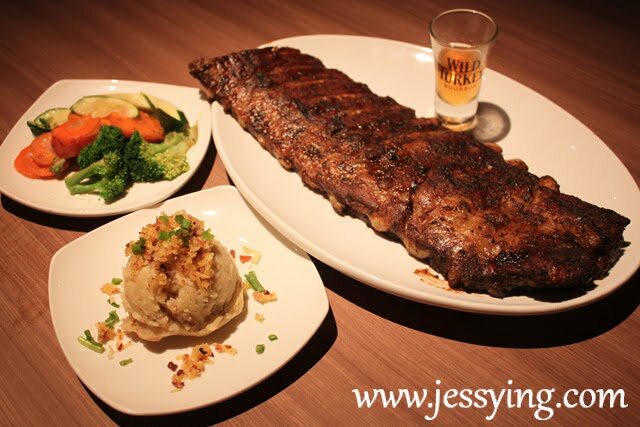 As the named suggested, the pork ribs is was fired up with a shot of whiskey to literally let us have the ommph feel! Below are some interesting pictures I took while the pork ribs on fire! 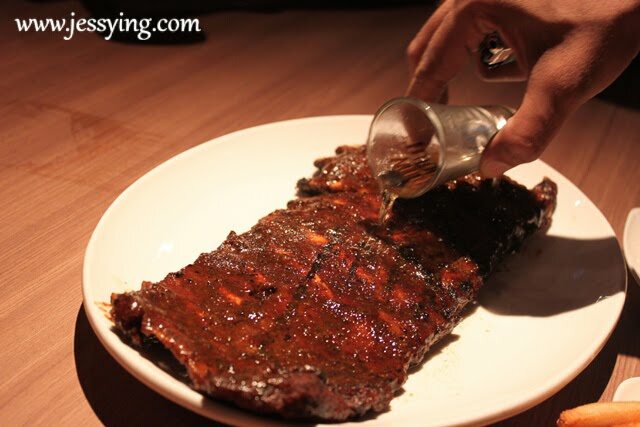 Pour a shot of whisky all over the pork ribs! 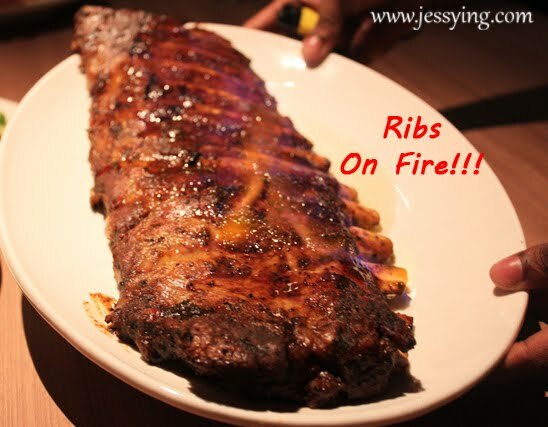 Staff light up the fire and the whole ribs was on FIRE!!! 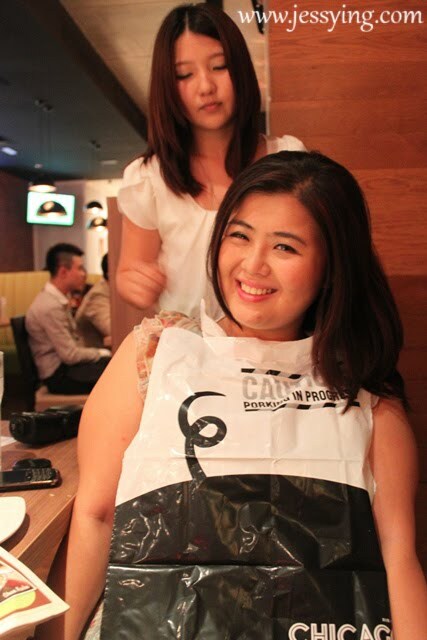 It was smoking hot when it was served on us. 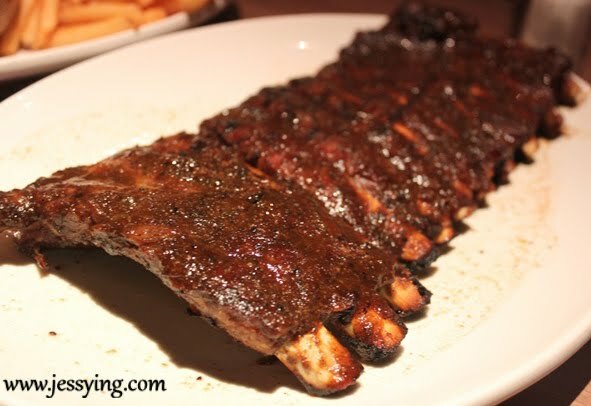 The taste of the ribs is pretty strong with the marinated sauce and whisky. And if you are not a fan of whisky, you might prefer the original flavour. Next we are served two grilled boneless chicken breast topped with their signature bourbon sauce and sprinkled with mixed cheese. The cheese is sinful but it is good! 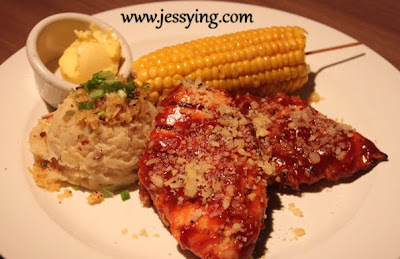 The side dishes of this Grilled Bourbon Chicken can be choosen, and here the highlight of the side dish is the "western style chicken rice" as some of them claimed. And I bet kids sure would love this too! 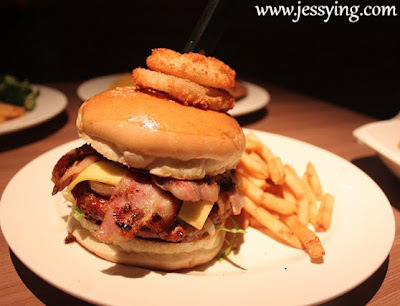 Description : A juicy pork burger loaded with Hickory BBQ sauce, topped with crispy bacon and cheese. Well I must say the bacon here are so good that I can't get enough of it. 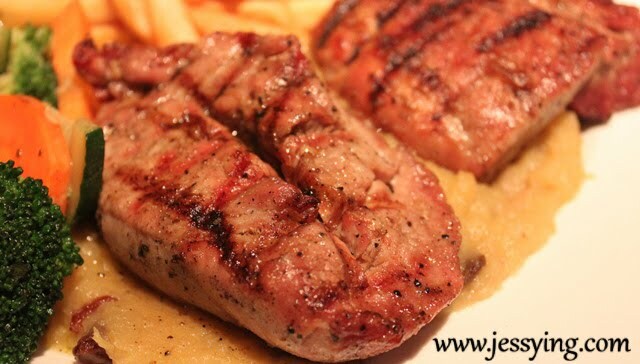 It is not too fat and grilled to perfection! 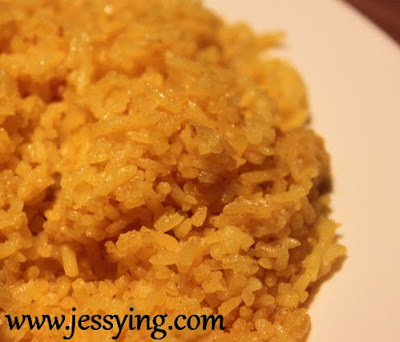 A must try for all! 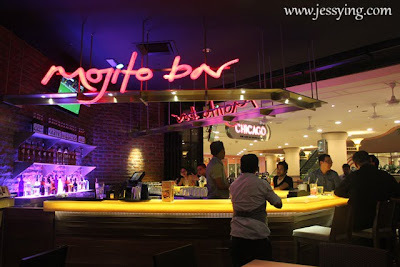 Besides pork , they actually served Shrimp Olio (RM32.90) for seafood lovers. 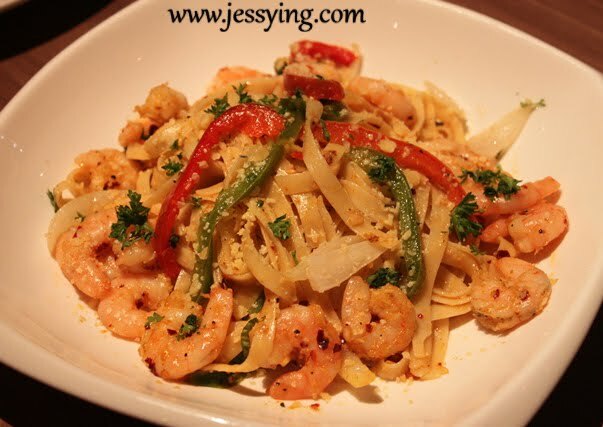 It is Fettuccine tossed with generous servings of shrimp in scampi butter. The taste of the olio is a bit tingly due to their sauce however I do appreciate the fact that they are very generous with the shrimps and the portion is big. 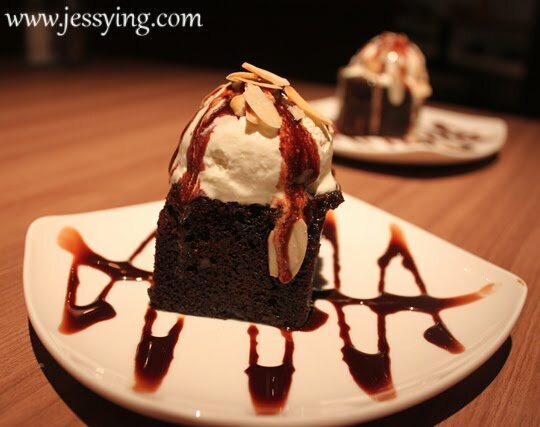 Finally after all the porky business, we have dessert!!! Brownie Royale (RM12.90) was really delicious, it just feel right for me! 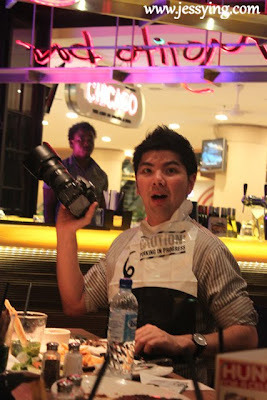 Caught Ah Bok aka Taufulou busy taking pictures of the food ! Haha looked at his expression, priceless! While me, well I enjoy eating the ribs with my hands feel more delicious everytime i am ripping of the ribs! Just before I end my review, I must show you one very interesting picture that is displayed in the restaurant. 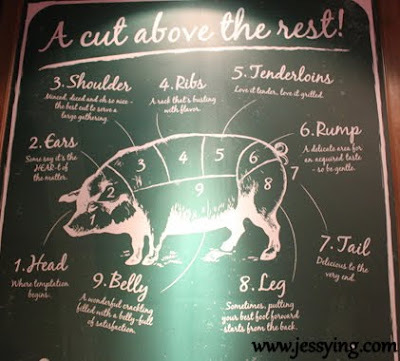 The different parts a pig that we could actually eat - but there are many parts that I don't eat. 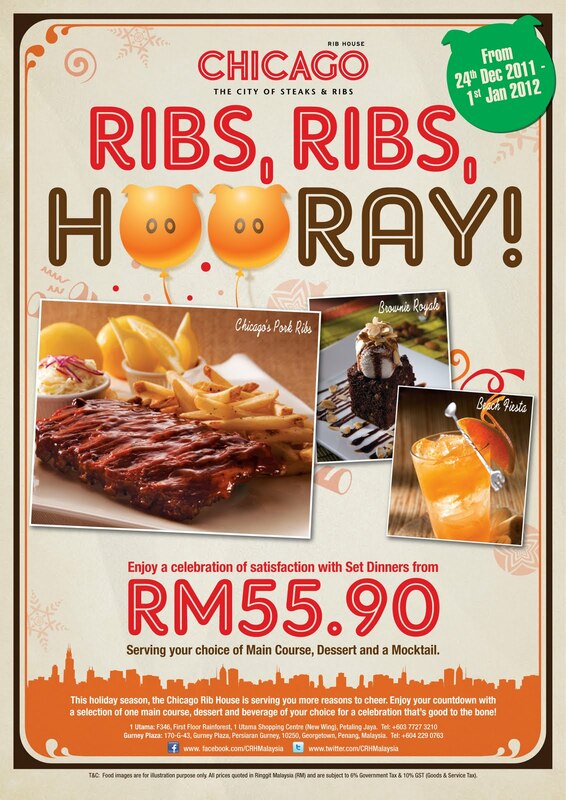 Chicago Rib House is currently running a Christmas & New Year promotion and this would be the best time for you to try out as for RM55.90 you can choose youra main course, dessert and a mocktail! p/s:They have an online menu with full description for you to check out! 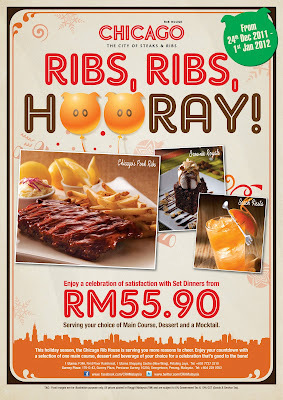 Must check out.. Pork ribs look really great lar.. cant tahan! Lucky you. 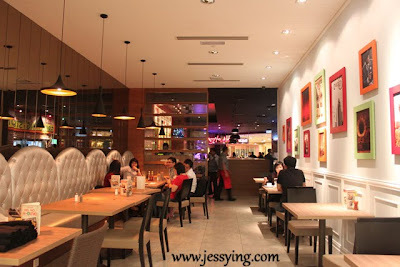 Because you were invited, I'm sure you didn't end up waiting 30 mins for your food like me - one dinner time. Which had left me no choice but to not visit them again, anytime soon.